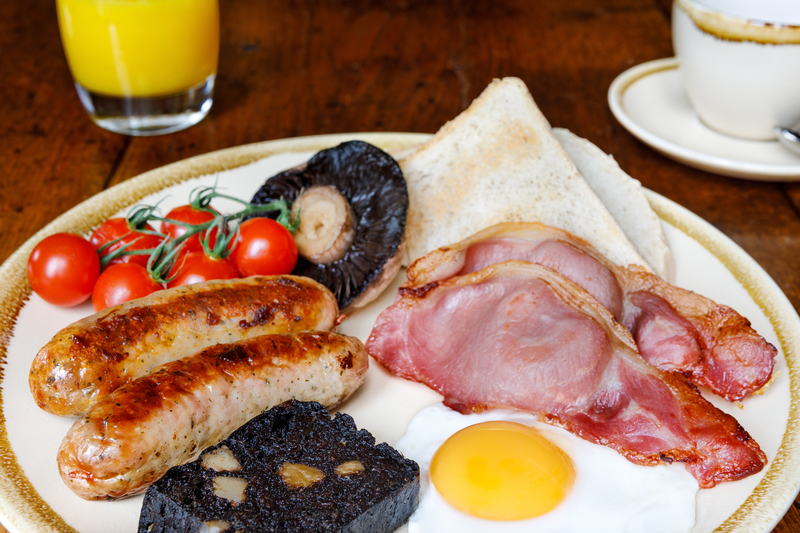 We offer an extensive breakfast menu using locally sourced ingredients. We are lucky to have quality producers, many within a 15 mile radius of Woodlands Farm. We bake our own bread and make our own marmalade using Seville oranges sourced from our local market in Northallerton. Our chef is Co-Owner Amy Callin, who trained at Leiths School of Food and Wine in London before starting her career as a Freelance Chef in the City. Amy then moved back to Yorkshire in 2006 and worked for Bettys Cookery School in Harrogate (part of the Yorkshire’s famous Bettys Cafe Tea Room business) as a Senior Course Tutor for nearly 10 years. 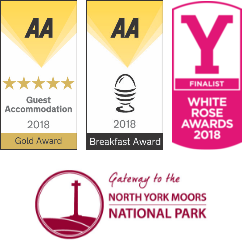 In December 2017, we were awarded a Gold award by North Yorkshire Healthier Choices campaign and in May 2018, the AA awarded us their Breakfast Award after a surprise Overnight Inspection. 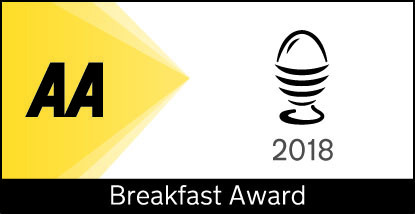 In July 2018, we were shortlisted for the Eviivo award for the Tastiest Breakfast. Breakfast is served in The Saddle Room in the main farmhouse between 7.30-9.30am and is £12.50 per adult or £6.95 per child (under 12 yrs). We do not include breakfast in our room rate so guests have the flexibility of choosing whether they want to have breakfast or not. We ask guests to pre-order breakfast the night before so we are able to offer our extended menu and reduce food waste. Below is a sample Breakfast Menu showing some of the dishes on offer. We also do a monthly/seasonal special breakfast dish too. Please let us know in advance if you have any dietary requirements. We can cater for Gluten-Free, Vegan and other diets, just ask and we can discuss your preferences. 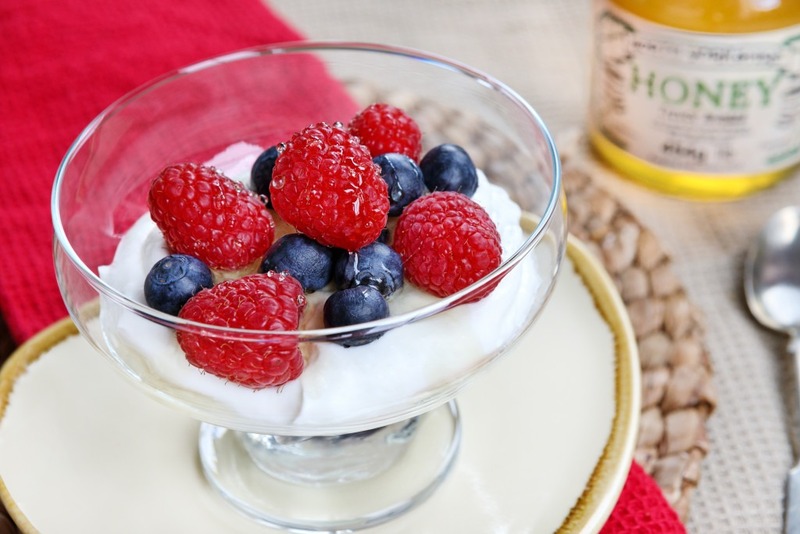 Stamfrey Farm Organic Low Fat Yoghurt with North Yorkshire Honey, Pumpkin and Sunflower Seeds. Homemade Bircher Muesli with grated Apple, Toasted Chopped Hazelnuts and Seasonal Berries. Homemade Toasted Breads with a selection of Yorkshire preserves and our own Seville Orange Marmalade. Continental Pastries, a selection of Breakfast Cereals and Fresh Berry Salad. Two free-range Yorkshire Eggs (scrambled, poached or fried); locally produced Sausages, two slices of Dry Cured Bacon, Black Pudding, Roast Vine Tomatoes, Field Mushroom and Baked Beans (optional). Gluten free, vegetarian and a lighter, reduced portion is available on request. Warm Homemade Scotch Pancakes with a Fresh Berry Compote, Creme Fraiche/Yoghurt with Maple Syrup/Honey. Smoked Salmon and Scrambled/Poached Eggs. Vine Tomato and Crushed Avocado with Lemon on Homemade Toasted Granary Bread. Breakfast Omelette of the day. Woodlands Farm makes every effort to comply with the dietary requirements of our guests. Please notify us of your specific dietary requirements to ensure we are able to provide accurate information and advice on the ingredients and allergens in our dishes. At Woodlands Farm, food is prepared in one kitchen so allergen based meals are prepared in the same area as allergen free meals, therefore we unfortunately cannot guarantee absolute separation of ingredients.